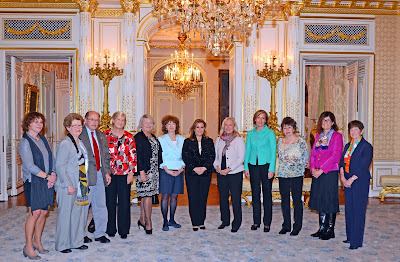 Today Grand Duchess Maria Teresa welcomed a delegation of members of the Conseil National des Femmes du Luxembourg (CNFL) at the palais. The reason behind the audience was the release of a book about Luxembourgish sportswomen at the Olympic Games from 1924 until 2012. Already yesterday, the Grand Duchess visited the photo exhibition Lëtzebuerg Moderne at the Fondation de l’Architecture et de l’Ingénierie au Luxembourg (FONDART). A visual of the visit is located on the website of the cour.